"This recipe works well for many occasions. This is also the type of recipe that you can add to or build on to make your own. 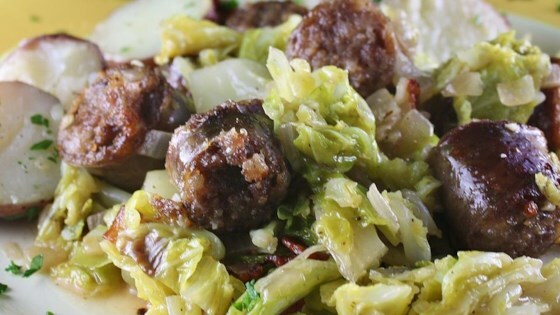 If you aren't too crazy about the taste of cabbage, keep in mind that the onion, bacon drippings, and kielbasa seems to tone down that cabbage-y taste a bit, and you can also add other things or spices to tone it down." Place bacon in a large skillet and cook over medium-high heat, turning occasionally, until evenly browned, about 10 minutes. Drain the bacon slices on paper towels and crumble. Reserve drippings in skillet. Cook and stir cabbage and onion in bacon drippings over medium-high heat until cabbage begins to wilt, 1 to 2 minutes. Stir bacon, salt, and pepper into cabbage mixture; cook until cabbage is wilted, 3 to 5 minutes more. Stir kielbasa into cabbage mixture, reduce heat to low, cover the skillet, and simmer until cabbage is lightly golden and tender, about 1 hour. The longer you simmer, the more brown that the cabbage will turn, but it will also give the cabbage a mushy texture by cooking it too long. This recipe also works excellent with sauerkraut instead of the regular cabbage. this was good! read reviews so I drain most of bacon grease ... will did cook again! This was great! Kids and hubby cleaned their dishes! Cut the recipe in half because I was nervous, bad idea! We all were looking for seconds! Thank you for sharing!